There’s no room for error when you go to work every day. Whether it’s construction or hauling or any other tough job, you need to be able to count on your equipment. That requires heavy duty trucks, capable of performing every demand, from daybreak to sunset. What you require is the redesigned 2017 Ford Super Duty F-250. America’s best-selling heavy duty trucks, the Super Duty F-Series, gets a facelift for a fresh new look in 2017. 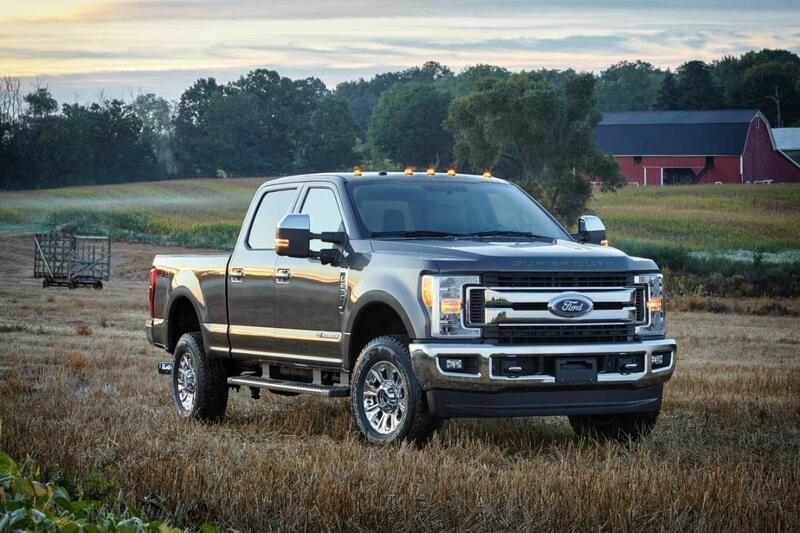 A massive, chunky front grille and angular, tall front headlights tie together a truly dominating presence as the 2017 Ford Super Duty F-250 rumbles down the road. Its body, from the stamped hood lip to the emblazoned tailgate, are pressed from military-grade aluminum in this generation, taking the Super Duty F-250 into the future. The 2017 Ford Super Duty F-250 can back it up too. For 2017, the F-250 offers class-leading conventional towing with a capacity of 18,000 pounds. It comes from the available 6.7-liter Power Stroke turbo diesel V8 with a mind-blowing 925 lb.-ft. of torque and 440 horsepower. The standard-equipment engine is no slouch either, a 6.2-liter V8 with 385 hp and 430 lb.-ft. of torque. Pair either engine with a supremely capable 4x4 system, giving road-gripping traction regardless of the terrain you’re on. Also new for 2017, the Super Duty series has cameras to help the driver all around. A center high-mounted camera gives a view of the cargo box, enabling easy view of an onboard load and simplifying gooseneck trailer connections. Available Surround View cameras give a 360-degree bird’s eye view to make parking and trailering more confident. Trailer Reverse Guidance makes backing up a trailer easy with signals and tips, and an available trailer-mounted camera improves visibility behind your rig. The totally redesigned 2017 Ford Super Duty F-250 improves upon already impressive technology. SYNC 3 adds voice-activated technology and infotainment, along with a responsive capacitive touchscreen. Optional navigation is available, as is Siri Eyes Free, Apple CarPlay and Android Auto for a connected experience. Driver Assistive features also make an appearance. Adaptive Cruise Control, Blind Spot Information System with Cross Traffic Alert and Trailer Tow, and Lane Keeping Alert aid the driver to stay in control, and restore control among distractions. What good is a truck if it’s not comfortable to drive? That’s why the 2017 Ford Super Duty F-250 improves in interior comfort. Work options include vinyl upholstery and carpet delete, providing easy cleanup. However, luxurious leather is available in many trims including King Ranch, Lariat, and Platinum trims, and a power twin-panel moonroof can be chosen. When work demands convenient functions, the F-250 takes care of it. Available upfitter switches can be selected, and an integrated trailer brake controller is standard equipment. When you need heavy duty trucks that work as hard as you do, choose the 2017 Ford Super Duty F-250. With attractive new style, powerful performance, and innovative technology, the best-selling F-Series pickup is sure to impress. You can find it at South Bay Ford- Commercial, your source for heavy duty trucks in Hawthorne, CA.